Students interested in land and legal or protective wildlife services should consider attending criminal justice school in Arkansas. With six national parks, over 50 state parks and roughly 2.5 million acres of national forest land in the state, the opportunity for natural resource enforcement officers is greater in Arkansas than in many other places around the country. A criminal justice degree can also open the door to many other law enforcement and legal careers, and many colleges and universities in Arkansas offer different degree levels for aspiring criminal justice students. Explore the educational options and degree requirements for these jobs right here, and see if attending criminal justice school in Arkansas is a good fit for your future. 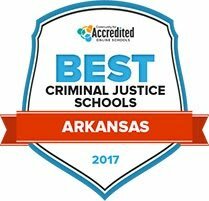 With a number of options to choose from, it can be hard to tell which criminal justice schools in Arkansas offer the best programs. The list below takes the most common denominators, such as tuition costs and graduation rates, into consideration to pinpoint the best overall criminal justice schools in the state. This can be a great jumping off point for deeper research as aspiring criminal justice students begin to narrow down the options. At the Beebe campus of Arkansas State University, students interested in criminal justice will be able to work through a fulfilling associate of applied science degree program, guaranteeing job placement through the quickest means possible. Students studying with this program may wish to concurrently complete one of ASUB's law enforcement technical certificates, including specializations in corrections, forensics, and explosive detection. Students enrolled at ASUB may also wish to consider taking online courses, allowing them to open up their schedules to work and family obligations. Students may be eligible for financial aid in the form of scholarships and grants. An associates of applied science degree in criminal justice earned at Black River Technical College will prepare students to enter the workforce in just two short years. Students at Black River will be taught by faculty members who have spent several years working in their respective fields. Students will be able to socialize classmates through numerous campus events and student organizations. Students transferring in from another institution of higher education may have the opportunity to receive credit for their previously completed coursework. Black River's academic advisement office is also available to ensure that all students are on the quickest path to graduation. Students attending the University of Arkansas Community College, Batesville, will be able to pursue an associate of applied science degree in criminal justice, allowing them to achieve their career goals as quickly as possible. Application to UACCB is free and class cost is low, ensuring that getting an education is more of an enjoyable experience and less of a financial burden. For students who still need support, though, financial aid is available in many forms. Several student organizations are available for enrolled students to enjoy in their extracurricular time. Tutoring services are available to guarantee student success. Students interested in studying to earn an associate of applied science degree in criminal justice have the opportunity to enroll at the College of the Ouachitas. This program is provided in an entirely online format, allowing out-of-state students to further their education without relocating. Several other degrees are offered at the College of the Ouachitas, many of which incorporate classes that are transferrable to other institutions. Students that have completed prior work at other colleges or universities may be able to incorporate these previous credits into their new program. A variety of student services are available to all students, even those who are studying from a distance. As one of Southeast Arkansas College's technical programs, the associate's degree in criminal justice technology will prepare students for several hands-on careers in the criminal justice field. SEARK offers a wide variety of degree programs varying in level, so incoming and undecided students can be certain that they will be able to enter a field that they are interested in. Credits earned at previous institutions may be honored at SEARK, helping to ensure students will not need to retake any classes. Several courses at SEARK are available online, as well, a benefit which may be particularly useful to students who are already employed or have a family to take care of. The University of Arkansas at Little Rock (UALR) provides several degree options for those interested in a criminal justice career. On-campus degree programs include an AS in law enforcement, a MA in criminal justice, and a PhD in criminal justice, which is the only one offered in Arkansas. Credits earned in the AS program can be used towards earning a BA in criminal justice. Online degree programs offered are a BAæand aæMS in criminal justice. The campus houses the Center for Study of Environmental Criminology, the Juvenile Justice Center and the Senior Justice center, providing students with opportunities in research and practice. Criminal justice students at the University of Arkansas at Pine Bluff (UAPB) can earn a BA degree in criminal justice through the Department of Social and Behavioral Sciences. The program consists of general education courses, major specific required and elective courses, an advanced seminar and internships, with some courses offered online and others face-to-face. The curriculum focuses on crime, law enforcement and the judicial system, and covers topics such as law, community relations, corrections, criminology, victimology, and working with juveniles. Criminal justice students can also participate in UAPB's Criminal Justice Club, a student organization that provides opportunities to work with other students and law enforcement agencies. Arkansas State University has several criminal justice and related degrees for students interested in pursuing a career or advancing in the field of criminal justice. Students can earn a MA degree in criminal justice at the main campus, or can minor or major in criminology, which is offered as both an online or on-campus program. The BA degree in criminology provides an in-depth look at criminal justice, offender rehabilitation and related law. Through a partnership with the University of Arkansas, Arkansas State University also offers AAS degrees in crime scene investigation and law enforcement administration, for students currently employed in law enforcement. Students planning to pursue a degree in criminal justice at the University of Arkansas at Monticello (UAM) can earn a BS degree in criminal justice through UAM's School of Social and Behavioral Sciences. The BS degree typically takes four years to complete, with 8 semesters, and includes general education, degree specific required and elective courses, an independent study course and an internship. In addition to workforce skills, students will develop critical thinking and research skills, preparing them for both a career in criminal justice and continuation into graduate school. Students interested in law school can work with a UAM pre-law advisor. Arkansas Tech University (ATU) offers both minor and associate degrees in criminal justice. Students can either combine the minor with a related behavioral science major, or through a partnership with Northwestern State University (NSU), can transfer the associate degree to NSU and work towards a BA in criminal justice. The minor and associate degree options are designed primarily for those looking to work in law enforcement, corrections and parole/probations. Students planning to pursue a law degree can minor in pre-law at ATU, or declare a major and incorporate courses into this major that will prepare them to take the LSAT and enter law school. As students begin the search for the perfect criminal justice school in Arkansas, there are many factors to take into consideration. Determine which programs offer online versus on-campus education options and the degree levels each college and university offers with this easy-to-use search tool. Data for each school also includes tuition costs, student teacher ratios and more information on the specific specializations and areas of study within the criminal justice program at each institution, and can be sorted based on individual priority. As prospective students begin researching which criminal justice school to attend in Arkansas, they should also consider which area of study they'd like to focus on. With concentrations ranging from law enforcement and public service to legal and judicial occupations, it's a good idea to check out the degree requirements for interesting careers before enrolling in school. Students may also want to consider other factors, such as salary, as they choose a career path. Check out this list of the most popular criminal justice careers in Arkansas below, and click for more information on the salary and degree each job requires in Arkansas specifically. Though the Arkansas Department of Parks and Tourism reports a cost of living slightly lower than the national average, students attending criminal justice school in Arkansas can enjoy higher job growth projections than many other states, especially in regards to nature and wildlife enforcement positions. Take a look at how Arkansas stacks up to the rest of the nation for grads after criminal justice school, in terms of salary and job growth, and find the degrees needed for each job by scrolling over the graph information below. From national parks to metropolitan areas, Arkansas provides a unique variety of areas for students to find employment in after criminal justice school. The map below shows which areas have the highest concentrations of public service and legal professionals in the state, as well as the average annual salary for each area. Scroll over the buttons on the map for more detailed information. A membership based organization promoting economic and business development, specifically centered on bringing new businesses to and improving current business practices in the state of Arkansas. This page lists the many industries operating in the state, and provides training resources for continuing business education. A collection of business and commercial service information can be found through the Arkansas SOS site, including details on community education initiatives, state business rules and regulations, corporate filings and financial disclosures. This is also a public resource for scam alerts and election information. From business advocacy to economic development, the Little Rock Regional Chamber is a membership networking group for businesses in central Arkansas. This site also offers information for businesses relocating from other areas and local business news. Information on tax registration, business licensing, corporate filings and other employer requirements can be found here. This page provides an all-encompassing small business checklist for those new or unfamiliar to legal compliance in Arkansas. The online hub for the State of Arkansas' Community Correction agency, ACC employees and other professionals in working or interested in careers in criminal justice in the state can find information on the state's parole, probation and substance abuse programs, specialty courts, transitional housing and other aftercare services. Volunteer information can also be found here. From information on the state's correctional facilities to a job board, the Arkansas DOC website provides a collection of handy resources for those interested in learning more about corrections. There is also information about the ADC Training Academy for aspiring correctional officers. Created in response to a growing prison population in the state, the Justice Reinvestment Initiative was enacted through the Bureau of Justice Assistance at the U.S. Department of Justice, with a focus on streamlining the parole release process to reduce inmate housing costs. Learn how to get involved on this page. An inmate re-entry program that assists adults being released from Arkansas prisons with probation and parole placement. The main goal of the program is to prevent offenders from repeating crimes, and those interested in careers in parole and probation can learn about volunteer and career opportunities here. A hub for the Arkansas judicial system, this website provides information on the courts, rules and administrative orders, jury service and legal meetings, training sessions and other events. Addressing mental health, anxiety and stress-related issues that judges, lawyers and law students face, the JLAP and their staff provide free, confidential counseling and other assistance to Arkansas judicial workers and students struggling with various personal or work-related stress issues. Volunteer opportunities are also listed on this page. A volunteer based program that helps children involved in juvenile dependency and neglect cases find safe, permanent homes. These volunteers are trained and appointed by the courts and act as the liaison between judges and children. Employment and volunteer information is also provided on this site. An organization focused on providing free or affordable legal aid to at-risk and low income individuals in Arkansas. Lawyers interested in doing pro bono work can connect with case workers here, and those pursuing justice based careers can check the site's news section for current job postings. With information for attorneys, students and the public, the Arkansas Bar website contains information on events, case summaries and provides a "Find a Lawyer" feature. Students can find job information, volunteer opportunities and networks with other young criminal justice professionals in the "Young Lawyers Section". Promoting equal justice for low-income Arkansas residents by offering free or low cost legal assistance. This site connects attorneys seeking volunteer opportunities to clients in need, and also promotes other justice-centered projects and community training sessions on a variety of topics from healthcare to taxes and housing rights. From employment opportunities to networking and support services, the ACP is a membership-based group for current and aspiring police chiefs in Arkansas. This website also provides insight into community activities and the organizational structure of police forces in the state. The main resource for aspiring protective service officers in Arkansas, this site provides information on officer standards, firearms qualifications, training schedules and materials needed to apply for and complete basic training and instructor programs. Providing a group voice for law enforcement officers across Arkansas, the AMPA provides a list of useful resources for those interested on learning more about law enforcement, crime and training standards in Arkansas. A collection of sheriffs from various parts of Arkansas committed to providing information, activities and programs based on current issues concerning law enforcement in the state. This site provides information on sheriff sponsored programs, legislative advocacy and employment opportunities. The ATOA is the next-level training program for Arkansas law enforcement and corrections officers involved in tactical operations. It also includes a membership based group that furthers inter-departmental communications and networking. A non-profit organization made up of game wardens across the state of Arkansas promoting proper wildlife law enforcement and legislative advocacy based on natural wildlife regulations. The group is active in the community and supports many charities, and also publishes the "Arkansas Wildlife Officer Magazine" with news and information. Focused on the enforcement division of Arkansas Game & Fish Commission, this site provides information on becoming a wildlife officer, reporting options, violation points and land use. Those interested in working in one of Arkansas many parks can find employment opportunities listed on this Department of Parks and Tourism page. Dedicated to conservation law and wildlife policy, the AWF provides a membership section and magazine in addition to community events and wildlife news.